Review: Kind of Cruel is a psychological thriller stemming from the investigation of two female murder victims over the span of several years. When Amber Hewerdine blurts out the words, Kind, Cruel, Kind of Cruel- the key phrase in the murder investigation- during a hypnosis session, her life is immediately turned upside down. Amber knows who the killer is, the answer is deep within her unconscious, but there are many barriers and self-defences that stop her from solving the mystery. Charlie and Simon from the local police are on the case and are determined to get to the bottom of Amber’s psyche, she is their only lead and they are keen to reveal the murderer. The author gives hints to the reader about the perpetrator, but it isn’t until the very end that all the questions are answered and it all begins to make sense. I certainly believed this suspect was the murderer from early in the piece, but I was still drawn into the mystery of WHY that person would commit these crimes. I particularly enjoyed the relationships, personalities and conflicts from Amber’s family network. Despite being an insomniac, sarcastic and analytic nature, Amber is quite a likeable protagonist as she is also quick witted and intelligent. She presents as a strong character but has very real vulnerabilities that lie beneath the surface. Amber is the adoptive parent of two young girls who she inherited when her best friend was murdered; this forms a sub-plot to the story. Then there’s the complex family dynamics of her husband Luke’s family, which consist of his brother Neil, his wife Jo, her sister, brother and mother and two sons. Jo is a fascinating character, even though I couldn’t stand her. Kind of Cruel is in a genre outside of my comfort zone, but I think all the psychological aspects and the mystery that oozes from this story drew me in. I must say I felt quite unsure throughout the whole book until I finished it, then when I closed it I thought, actually that was pretty good. It was one of those books that I couldn’t make my mind up about until the very end. I don’t think this is something I would usually read either but I really enjoyed your review and if I see it the library I’ll definitely pick it up! 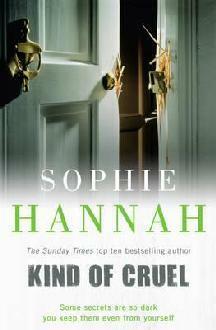 I enjoy a good psychological thriller and have read a few by Sophie Hannah. This sounds pretty good.